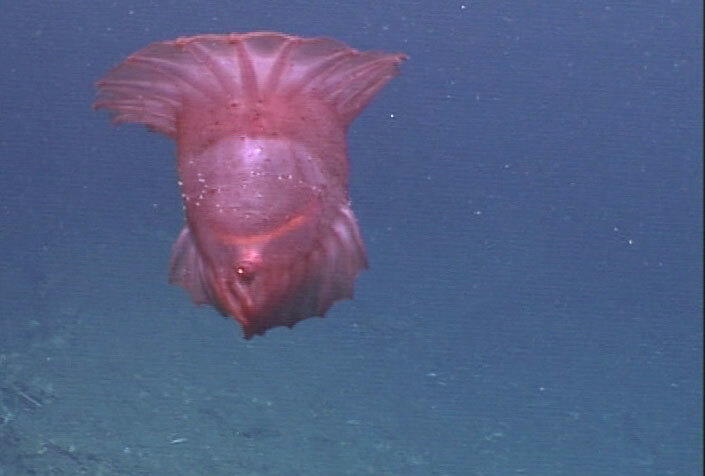 A mesmerizing deep-sea dancer by the name of Enypniastes eximia is enjoying a moment in the limelight after being filmed in the Southern Ocean off East Antarctica for what officials describe as the first time in that region. The footage of the sea cucumber, which is colloquially referred to as the “headless chicken monster,” comes courtesy of new underwater camera technology being used by researchers to aid in marine conservation efforts. Video of the holothuroid was shared Sunday by the Australian Antarctic Division, which is part of Australia’s Department of the Environment and Energy. According to the division, the Enypniastes eximia had previously only been filmed in the Gulf of Mexico. 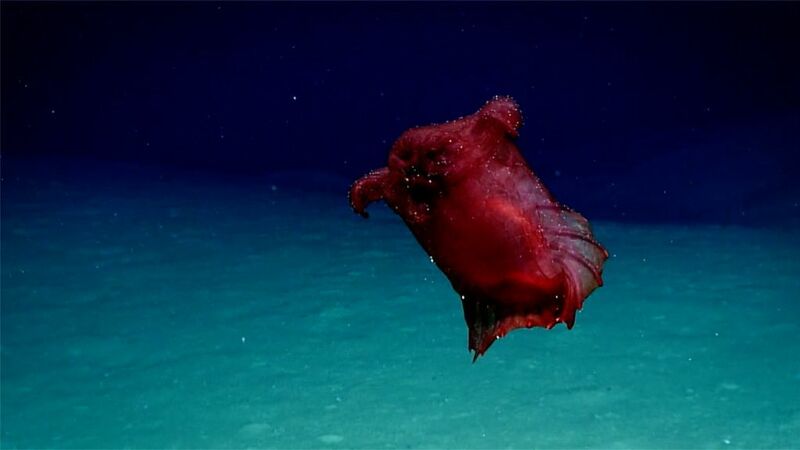 This remarkable little creature—one of hundreds of known species of sea cucumber—spends most of its time buoying along the seafloor and using its “modified tube-feet” to feed on surface sediments, according to Australia’s National Oceanic and Atmospheric Administration (NOAA). They can swim if they want to, and use fin-like structures to escape predators or lift off the ocean floor. Sea cucumbers are an important part of the marine ecosystem—they’re sometimes referred to as the vacuum cleaners of the sea—but some are on the brink of extinction as the result of overfishing. I find this video absolutely amazing. Who knew that sea cucumbers could act like this? This entry was written by whyevolutionistrue and posted on October 22, 2018 at 12:00 pm and filed under invertebrates. Bookmark the permalink. Follow any comments here with the RSS feed for this post. Both comments and trackbacks are currently closed. I had a sea cucumber curry-type dish in the Philippines many years ago. I quite liked it, and would order it again! I have no idea how this dish was different from a Chinese sea cucumber dish. The sea cucumbers in my dish were chopped in to bite-sized pieces. The Chinese ones I’ve seen usually aren’t chopped up. They slice them down the middle and it’s served in one piece. Usually with sauce and vegetables. They’re pretty much flavorless but they are kinda like jelly or agar. It’s like the creatures in Black Mesa. Those familiar with a certain video game will know what I mean. What a little beastie, species galore! I like the idea of using cameras to monitor fishing. It is not dissimilar to their use for conservation, observation and protection of terrestrial animals. I see they are also using drones as well, watching for poachers would be a good use for them. Infra red, night vision cams on board etc., that would be a job (for me). Every species is fascinating, so I get annoyed when the media refers to any animal as a “monster”, simply because most people are unfamiliar with it. We humans are far more monstrous — in how we treat animals, the environment, and ourselves. When you get right down to it, nature is amazing. Stranger than fiction, once again, neither. sci-fi nor Hollywood writers could dream up something so bizarre and yet so cool. I occasionally get lucky and catch the NOAA’s Ocean Explorer live cams for some fantastic underwater exploration (right now it’s just mapping the sea floor, in the Gulf of Mexico or thereabouts, so just computer screens) and it’s mesmerizing. It’s fun to see what unexpected species pop up and to hear the scientists try to ID them on the fly. Fascinating. Indeed a “remarkable little creature” (though I don’t much like the term ‘creature’). But how little/big? I wonder what it does with its pigmentation.